I sincerely hope you are in the habit of taking a moment to check out the Tangle Refreshers because every other Friday, in addition to the five tangle gems from the past (many use these as their Zentangle® prompt of the day), I usually share tangling tips and/or advice that’s well worth reading. Quite some time ago I published these tips for a “Frugal Friday” and thought we’d take a look at them again today. Here is a “reprint” of those handy tips from Tangle Refresher 88. The first tip is how to squeeze a little more life out of your Micron Pens. As you may know, when you’re not using them Microns should always be stored flat (i.e., horizontally, not vertically). This prevents the ink from pooling at the bottom of the pen and creating one nasty and messy surprise when you uncap it. 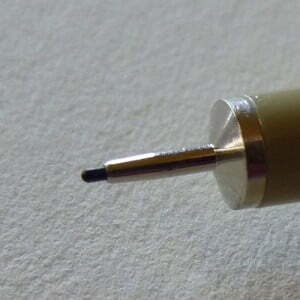 Also the “nib” is actually a delicate, thin plastic tube that requires a very light touch. If you haven’t seen those tips before, please see this article here on the site. At CZT Kathy Redmond’s training seminar, Zentangle® co-founder Rick Roberts demonstrated how to perform surgery on a Micron to coax a little more mileage out of it. Even if you follow all this advice [about how to store and use the Microns], there will come a time when your pen really does run out of ink. You will notice scratchy lines and some skipping – sometimes I like the look, but not always. There is a way to get a little more mileage out of your Sakura pen. Here’s the link to Kathy’s tutorial. Honestly, I like to be frugal but that’s not an operation I relish undertaking. I’d undoubtedly end up covered in the ink that was left in the pen. Nevertheless I know there are many of you who like to become one with their tools, and now you have the information to have at it! Tangler Lora Morris alerted me to this video on making your own blending stumps, and she also very thoughtfully provided a downloadable template for your convenience. Many thanks, Lora. Here’s the video, and here’s Lora’s template. Lora writes, “If you want to make a thicker Blending Stump, roll one or more pieces together. Getting the angle right takes practice, but you learn pretty quickly what works and what doesn’t.” You can get different effects with different paper stock too. Please let me know in the comments if these tips were useful for you! And feel free to share your own too. BTW as you enjoy these tangles please do leave a comment of thanks and encouragement to show the artists you appreciate them for sharing their creativity for you to enjoy. And please share a link to your favorite tangles with your followers on all your social media. Linda, flipping the ink cartridge is really very easy. If you are concerned about getting the ink on you, use tweezers to gently flip the cartridge and slip it back in the barrel. I had and old 01 Micron that I had bought years ago, and when I learned about Zentangle Art, I dug that pen out and it worked beautifully for quite a while. When it started getting scratchy, I followed Rick’s instructions, and the ink started flowing perfectly again! The only damage done to the pen was plier tooth marks on the plastic end cap. Getting that off was the most difficult part. Patience, a little gentle twisting and wiggle-pulling did it.